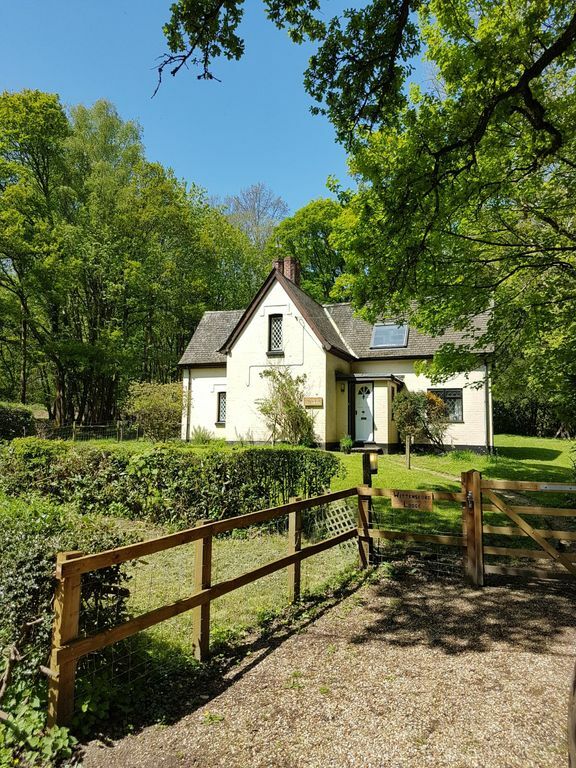 Self catering cottage with ¼ of an acre garden with stream and one acre of forest for you to explore. Located within the New Forest National Park, it's ideal for touring the New Forest and South Coast. All year round availability. Easy access from M27 to visit the Historic Portsmouth dockyard, Southampton with ferries to the Isle of Wight and the beaches of Bournemouth. There are many attractions within easy reach: Beaulieu Motor Museum, Buckler's Hard, Peppa Pig world at Paulton's Park, Go Ape at Moors Valley Country Park, Bolderwood Deer Sanctuary and Exbury Gardens with steam train to name just a few. The property is approx 5 miles from Lyndhurst village which hosts the New Forest Visitor centre. Great location for exploring the New Forest and the Hampshire coast. Wonderful walks, beautiful scenery- Good for spotting the new forest ponies and other animals who wander the forest and heath land, such as cows, pigs and sheep. Deer are a common sight too and we often get a group that visit the back garden in the early evening! There are lots of traditional country pubs and tea shops to enjoy a drink or a meal after a long walk. There are large shopping malls in Southampton and Bournemouth as well as cinemas and theaters. We're close to the coast, with lovely beaches at Lepe and New Milton, from which you'll get a good view of the Isle of Wight- It only takes an hour on the ferry from Lymington to visit the for the day. There are so many activities and tourist attractions in Hampshire and Dorset to suit everybody's taste: lots of water sport activities for young people, plenty of beautiful gardens to wander around and view, historic forts on the coast and lots of wildlife to find. The cottage has a large garden surrounding it with a stream running through it to the river, which runs along the front of the house and through the forest. The garden leads into 1 acre of private ancient woodland for you to explore. Deer regularly visit the garden and woodland as well as a wide range of birds. A fifteen minute walk up the lane and past the farm will take to you to two lovely pubs serving drinks and great food. From the front of the house you look directly out into the forest itself where new forest ponies will spend their days looking for food. The cottage itself is simply decorated but, cosy and warm. It's a wonderfully peaceful setting, while being within driving distance of many great places to visit. Family bathroom with WC. Shower room with WC downstairs. Towels are not provided. Lounge has 1 sofa leather, and 3 armchairs, TV and DVD player, stereo player. Kitchen is equipped with, electric cooker, toaster, kettle, microwave, washing machine and fridge with small freezer compartment. Notes on accommodation: Electric storage heating. No smoking. Outside: Quarter of an acre garden, mainly grass with a small patio and 1 acre of woodland. Cleaning / Towels / Linen / Maid service: Linen is included but not towels. Other: Dining room has large dining table with 6 chairs. Nearest beach at Lepe 20 mins. Southampton 25 mins. Bournemouth 40 mins. Nearest airport and ferries Southampton and Portsmouth. Nearest rail stations, Totton or Brockenhurst.